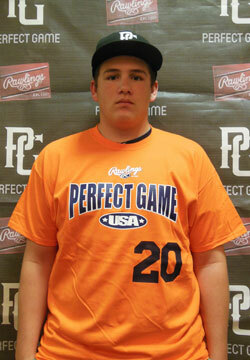 Alex Moore is a 2015 RHP with a 6-3 235 lb. frame from Sarasota, FL who attends Riverview HS. Tall, very mature, broad shouldered, strongly built frame and looks the part on the mound. Pitches from a three-quarter arm slot and tops at 86 mph with his fastball. Shows good arm speed and hides the ball well. Comes out clean and locates down in the zone. Flashes sinking action on his 79 mph changeup and has a tight 72 mph slider that he spots well. Varies it from is 69 mph curveball, which flashes solid 11-5 depth. Knows how to command four pitches effectively. Very good student.